I took a mini quilt class this week with Joyce N. It was called Sunshine and Shadows. 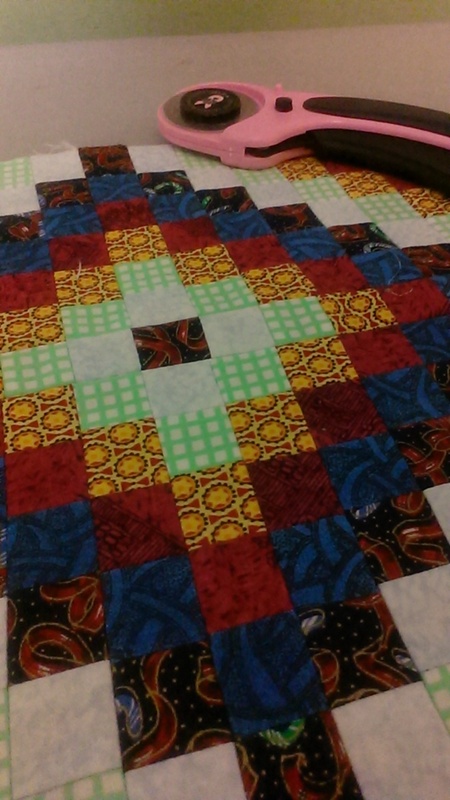 It's like a trip around the world quilt. I've been wanting to make a mini quilt for some time now. I pulled colored strips from my stash and with Joyce's help, she helped me arrange the colors so I would get a dramatic effect. As we sewed, Joyce gave tips on ironing and pinning and used a neat tool to arrange the blocks to transport from the ironing/cutting board to the sewing machine. I really enjoyed this class and learning neat techniques from this master sewer. This center part is only about 9" square. I plan to put a small border and a larger border on it. I'll finish it this weekend to bring to guild on Monday for Show and Tell. I'll show you too on Monday.